The overarching principles below are a useful guide for understanding the written description, drawings, and claims in a utility patent application. These principles are difficult to internalize, implement, and apply without the mentoring of an experienced patent attorney, and I do not advocate that inventors or startups draft patent applications without competent patent counsel. Use this information to better interact with patent counsel. Attorneys require years to learn the art of preparing a patent application. From this experience, patent attorneys learn to balance opposing goals. For example, the first goal is to secure broad claims to block competitors from competing with the inventor in the marketplace. A second, opposing goal is to present sufficiently narrow claims to avoid the prior art so that the USPTO will grant a patent on the invention. The following, overarching principles are a useful guide for trying to understand the various goals which may oppose each other in preparing a patent application for filing and prosecution before the USPTO. The point of novelty also forms the basic outline of the patent application. The point of novelty should be repeatedly described in multiple sections of the patent application— Claims, Abstract, Brief Summary, and the Detailed Description—and should be, as far as possible, illustrated in the Drawings. Ultimately, the point of novelty should be prominent and clarified throughout the patent application. An attorney’s goal when writing a patent application should be to make the point of novelty clear and up-front to the reader (i.e., inventor, investor, judge, jury, competitor). During patent prosecution, the invention, as it is recited in the claims, is viewed as a whole. But when thinking through the drafting process of the patent application, it is helpful to prepare the draft patent application based on the point of novelty. During examination, the examiner may provide prior art references that disclose the point of novelty. In this scenario, the focus of the claims should be shifted to an alternative embodiment, or a different aspect of the point of novelty. If the examiner cites a prior art reference that is close, but not identical, to the point of novelty, the claims may have to be narrowed. If, as in the example of the mechanical pencil in Chapter 1, the cited prior art disclosed a mechanical clicker mechanism, the claims may have to be narrowed to focus on a specific, unique feature of the mechanical clicker mechanism to distinguish it from the cited prior art reference and obtain the patent. Accordingly, a patent application should be drafted with the possibility of claiming a narrow aspect of the point of novelty or claiming a different point of novelty altogether in the future during the examination stage. After filing, the patent application cannot be altered by adding new matter or deleting information from the patent application. As such, whatever strategy one might want to employ during the examination stage, the information to implement that strategy must be included in the patent application at the time of filing. In sum, articulating the point of novelty is essential to deciding what to include and exclude from a patent application. It is also important to structure the patent application so that the focus of the claims can be narrowed or shifted if, and when, needed during the examination stage. The “enablement requirement” is stated in 35 U.S.C. § 112(a) and dictates that the patent application enable one of ordinary skill in the art to which the invention pertains to make and use the full scope of the claimed invention.15 That is, the enablement requirement demands a kind of instruction set or “recipe” for the invention that describes the important relationships between the product’s different structures in such a way that one of ordinary skill in the art can make and use the invention. In the mechanical pencil example, the relationship between the removable eraser and the body of the pencil may be important to its basic functioning. The user may need to remove the eraser from the pencil body to add additional lead rods. Additionally, the internal clicker mechanism needs to be explained in detail so that an engineer could understand how to design and produce it. An applicant must include a description of the product explaining how to “make” and “use” it in the Detailed Description section. This is like an instruction manual included with products when they are sold. The “best mode requirement” is also stated in 35 U.S.C. § 112(a) and requires the inventor to disclose the best way known by the inventor to implement the invention.16 This does not require that the best mode, conceivable by anyone, be included in the patent application. It only requires that the best mode known by the inventor at the time of filing be included in the patent application. Also, if a better mode is conceived of after the filing of the patent application, it could not have been included in the patent. If the inventor designs a better mode of carrying out the invention after the filing of the patent application, the patent would still satisfy the best mode requirement and its validity would not be in jeopardy. Sometimes, inventors want to exclude the best mode from the patent application in an attempt to protect it as a trade secret. However, fulfilling the best mode requirement is required by law to obtain a patent. Even though the examiner rarely rejects a patent application when the best mode requirement is not met, I nevertheless recommend doing so as it is in the best interest of the inventor. If the best mode is not disclosed in the patent application, the inventor cannot seek protection for it. The best mode is presumably the preferred mode among many, and not including it in the application would force the inventor to pursue only a broad claim that would be more likely to be rejected. The inventor might not have the option of narrowing the claims to avoid the prior art for obtaining a patent. For example, if prior art is found that already teaches the broad, claimed concept, the examiner would reject the application and not issue a patent. If the best mode was included in the patent application, then the inventor has the option to narrow the claims to the best mode. If the best mode was not included, the contents of the patent application are fixed and unchangeable upon its filing and new information cannot be added to an application after the filing date. In this case, the invention would have no option for narrowing the claims to get around the cited prior art. The best mode should therefore be included in the original patent application so that the claims can be narrowed to the best mode in this situation. Best mode requirement issues frequently arise with chemical or drug formulations. Inventors may want to keep the specific ingredients of a formulation secret while seeking to protect the generic formulation. This is not advised because, in addition to the above reasons, the inventor and patent attorney have a duty of good faith and candor to the USPTO. Failure to disclose the best mode may be considered a breach of this duty and have serious implications during enforcement of the patent. The patent application must satisfy the written description requirement17 by disclosing the invention in the textual description and drawings of the patent application. To meet this requirement, the patent specification (i.e., the actual text and drawings found in the patent application) must show that the inventor conceived of (i.e., possessed) the claimed invention. Otherwise, the claims will be deemed invalid for failing to satisfy the written description requirement. For example, in Gentry Gallery, Inc. v. Berkline Corp., Gentry (the patent owner) sued Berkline (the accused infringer) for patent infringement on its patented sectional sofa with a control center. At issue was whether the sofa, which the inventor claimed to possess, included a control center (i.e., storage for a remote control) at any location on the sofa. The Claims section stated that the invention was a sectional sofa that included a control center. The patent specification, however, described the control center in a specific location but did not appear to suggest other possible locations for the control center. The court interpreted the absence of alternative locations for the control center in the patent as demonstrating that the inventor did not conceive of (i.e., possess) a sofa with a control center placed at any location. The court maintained therefore that the patent did not satisfy the written description requirement because it did not show that the inventor possessed the claimed invention of a sofa with a console that could be located anywhere. Even though the Claims section did not limit the location of the console to one area, the patent’s specification made clear that the invention conceived of only a version with the control center at one particular location. To avoid this interpretation, the patent drafter should have described the control console’s location as a preferred location and then included descriptions of other possible locations. The written description requirement also necessitates that the specification provide support or antecedent basis for each example of the claim terms and phrases found in the Claims section. That is, the other sections of the patent application must reference and explain if needed the terms used in the Claim section. For example, claim 1, shown in column 6 of the patent example in Appendix B, refers to “an upper link pivotably attached to the front frame.” The term “upper link” is identified as reference numeral 40 and “front frame” as reference numeral 12 in columns 3 and 4 of the patent example in Appendix B. These parts are discussed in the patent’s Detailed Description in column 3, line 12, column 4, and line 13 as well as shown in Figures 1 and 2. Because of this explanation in the patent’s Detailed Description, someone reading the claims could understand the meaning of the phrase “an upper link pivotably attached to the front frame” as it is used in the claims of the Claim Section. The specification in this instance provides antecedent basis for the claim language. The Manual of Patent Examining Procedure (MPEP) states that the patent specification should ideally serve as a glossary for terms found in the Claims Section of the patent application. This is so the examiner and the public can clearly ascertain the meaning of the claim terms. The rules (37 CFR 1.75(d)(1)) require that the claim terms find clear support or antecedent basis in the specification so that the meaning of the claim terms may be ascertainable by reference to the specification. Following this rule also helps to satisfy the statutory written description requirement. Simply put, the patent application is a written explanation (i.e., text and drawings) of the invention that should cover the point of novelty and details thereof. An inventor should not rely on features and aspects that could be merely implied by the text and drawings. It may seem a simple suggestion to make explicit that which is implicit in the text and drawings, but it is actually very difficult to do. Patent attorneys work on this when drafting a patent application. The inventor must also review and check that this has been done. This will increase the likelihood that all patent requirements are met and minimize potential, future litigation issues. This case illustrates that reasonable minds can have different interpretations of a patent application’s implicit content. The District Court and the Federal Circuit arrived at different conclusions as to what was implicitly taught by the patent. Although difficult, the goal of drafting a patent application is to make explicit those important aspects that might be implicit within the text of the patent application. Inventors ought to review the patent application carefully and provide feedback to the patent attorney to be sure that all the inventor’s ideas are explicitly stated and not omitted or left implicit. When there is a combination of aspects (e.g., chuck wall and reinforcing bead) that work in conjunction with each other to achieve a goal (e.g., reduce aluminum usage), it may be useful to state explicitly within the specification that the inventor contemplates that each aspect may achieve the goal either in combination with each other or individually. This is just one example of how one can make implicit features explicit. There are many more blind spots that writers have that prevent one from making explicit that which is implied by the text. The defendant (Revolution) attempted to avoid liability by asserting that the invention failed to meet the written description requirement since the claims described the solution to only one of the problems and not both (i.e., decreased strength and stable support). Hence, Revolution argued, Aspex’s patent did not show the inventor had possession or conception of an invention that solved both problems, and Aspex had not satisfied the written description requirement and their patent should be invalidated. The court disagreed with Revolution. The court held that inventors can craft claims to address one or several problems and that the written description requirement is satisfied for each claim as long as the description conveys that the inventor was in possession of the invention recited in the claims. Although Aspex (patent owner) survived the challenge to its patent, this case illustrates the dangers of preparing one’s own patent by a lay person. It illustrates the types of arguments that accused infringers and defendants may raise to avoid patent infringement liability. A patent application prepared without legal counsel is more susceptible to this type of attack since lay people would not be aware of these types of issues. Moreover, the Aspex case illustrates that the benefits of an invention should be explained separately and not as if they are interdependent (i.e., described as disjunctive instead of conjunctive). For example, the benefits of a mechanical pencil may be that it does not require a sharpener and can consistently produce lines of uniform width. To write a disjunctive description, the patent application may highlight the various aspects of the mechanical pencil that can be configured to achieve either one or both benefits (i.e., these benefits should be described not as dependent upon each other, but achievable independent of each other). This written description requirement, among others, might be discussed in a DIY patent drafting handbook. However, a layperson would have difficulty drafting a proper written description. A patent attorney learns how to write a well-crafted description of the invention through years of practice and mentoring by a senior patent attorney. The patent application should describe the invention in sufficient detail so that it is clear that the inventor had possession or conceived of the claimed invention. If the claims are too broad, the patent may be invalid for failing to satisfy the written description requirement. Without the aid of a patent attorney, a patent application’s mistakes and weaknesses are usually uncovered only after filing, when the application is being examined, or after the application has matured into a patent and potential infringers have attempted to invalidate the patent. The mistakes sometimes cannot be resolved at that time. The information in this section is meant to help you work more efficiently and thoughtfully with a patent attorney to create a better prepared patent application. 14. Aspects of the invention unrelated to the point of novelty are generally not included in the patent application, but aspects that intersect with the point of novelty should be included. Competent patent counsel should be consulted to determine which alternative embodiments and peripheral features should be included in the patent application. Alternative embodiments achieve the same results as the invention but a different or sub-optimal way. Peripheral features describe, for example, the types of materials used to make the invention. 15. The enablement requirement is dictated by statute 35 U.S.C. § 112(a), which states “the specification shall contain a written description of the invention, and of the manner and process of making and using it, in such full, clear, concise, and exact terms as to enable any person skilled in the art to which it pertains, or with which it is most nearly connected, to make and use the same, and shall set forth the best mode contemplated by the inventor or joint inventor of carrying out the invention.” (See also Appendix F). 16. See Appendix F “The sole purpose of the best mode requirement is to restrain inventors from applying for patents while at the same time concealing from the public preferred embodiments of their inventions, which they have in fact conceived. The best mode inquiry focuses on the inventor’s state of mind at the time he filed his application, raising a subjective factual question. The specificity of disclosure required to comply with the best mode requirement must be determined by the knowledge of facts within the possession of the inventor at the time of filing the application.” See Glaxo, Inc. v. Novopharm , 52 F3d 1043, 1050 (Fed. Cir. 1995). The enablement requirement can be distinguished from the best mode requirement as: “Enablement looks to placing the subject matter of the claims generally in the possession of the public. Best mode looks to whether specific instrumentalities and techniques have been developed by the inventor and known to him at the time of filing as the best way of carrying out the invention. The enablement requirement, thus, looks to the objective knowledge of one of ordinary skill in the art, while the best mode inquiry is a subjective, factual one, looking to the state of the mind of the inventor.” Glaxo, Inc. v. Novopharm LTD., 52 F.3d 1043, 1050 (Fed. Cir. 1995). 17. Gentry Gallery, Inc. v. Berkline Corp., 134 F.3d 1473, 45 USPQ2d 1498 (Fed. Cir. 1998). 35 U.S.C. § 112 sets forth the requirement for the specification of the patent application by requiring that it contain a written description of the invention in sufficient detail to enable a person of ordinary skill in the art to practice the claimed invention. See Appendix F.
18. Crown Packaging v. Ball Metal (Fed. Cir. 2011). 19. The patent at issue had broad claims directed to one, but not both, of the features. 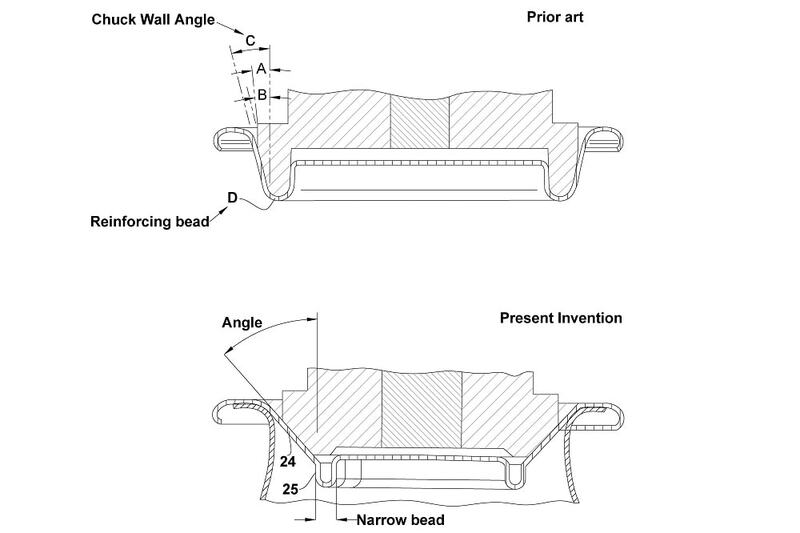 The claims were broadly written, referencing only the large angle chuck wall (Figure 6, #24) regardless of the width of the reinforcing bead (Figure 6, #25). In Crown packaging v. Ball Metal, the defendant (Ball Metal) argued that Crown Packaging’s patent claim did not satisfy the “written description requirement,” as the specification did not describe in the embodiment that was directed only to the large angle chuck wall (Figure 6, #24). Instead, the specification referenced both the large angle of the chuck wall (Figure 6, #24) and the narrow reinforcing bead (Figure 8, #25). The District Court agreed with the alleged infringer but on appeal and after reviewing the specification and the structure of the application’s Claim Set, the Federal Circuit reversed this decision and the patent owner won. Regarding the specification, the Federal Circuit stated: “nowhere does the specification teach that metal saving can only be achieved by increasing the chuck wall angle along with narrowing the reinforcing bead” (emphasis mine). With respect to the structure of the claim, the Federal circuit noted that the original independent claims were directed to the chuck wall angle without reference to the narrow reinforcing bead and that the narrow reinforcing bead limitation was added as a dependent claim. The claims show that the applicant’s conception of the invention was limited to reducing the metal used only with a large angle chuck wall, regardless of the size of the reinforcing bead. Hence, according to the Federal Circuit’s decision, the written description requirement was met. 20. Revolution Eyewear, Inc. v. Aspex Eyewear, 90 USPQ 1733 (Fed. Cir. 2009). 21. In a case title, the patent owner is usually listed first and the accused patent infringer second. However, the accused patent infringer is listed first if a patent owner has threatened litigation against an accused patent infringer who then counter-files a “declaratory judgement action” (DJ action). An accused patent infringer requests a DJ action to declare that there is no infringement. This enables the accused patent infringer to continue to conduct business without being under the threat of litigation. With a DJ action, an accused patent infringer does not have to wait for the patent owner to file the patent infringement This is what happened in this case. 22. Revolution (the accused infringer) had built a similar device but mounted the sunglass lenses on the bottom, instead of the top, of the magnetized projections on the lenses. Revolution argued that the patent owner’s patent claims of infringement were invalid for not being commensurate with the scope of the detailed description. The patent specification discussed both the decreased strength and stable support problems of the prior art and asserted that the claimed invention solved these two However, the claims were directed to only the decreased strength problem and not the stable support problem. Since the claims were broad enough to cover both top and bottom mounted sunglass lenses, Revolution contended that the claims were not commensurate with the detailed description. The Court disagreed. It held that inventors can craft claims to address one problem or several and that the written description requirement is satisfied as to each claim as long as the description conveys that the inventor was in possession of the invention recited in the claims.